Double Corn Buttermilk Cake #SundaySupper | What Smells So Good? As much as I want to, I don't get into much variety in my cooking over the Summer months. It correlates directly with how much work my garden needs at the time - if I'm lucky, it's almost maintenance-free, needing just minutes of my time every few days to weed or harvest. If, like last year, it was more work to keep it running than it bothered producing - basically sucking up hours in a flurry of under-nail "perma-dirt". Even if the garden isn't playing nice, the farmers markets almost always do! In addition to the two we have in my city, there's an almost 100% organic market about 45 minutes away that consistently blows me away every year. Late in the season last year, I came across a drastically marked-down box of local peaches and plums there at the end of the day - slightly blemished in the sense that they had tree marks, a tiny bruise, or an indent caused by growing too close to the tree. The peaches were eaten in short order - chopped up over bowls of oatmeal or dry cereal or cooked into Purely Peach Jam. Turning to the plums, though, I didn't really feel like doing the fresh eating thing. 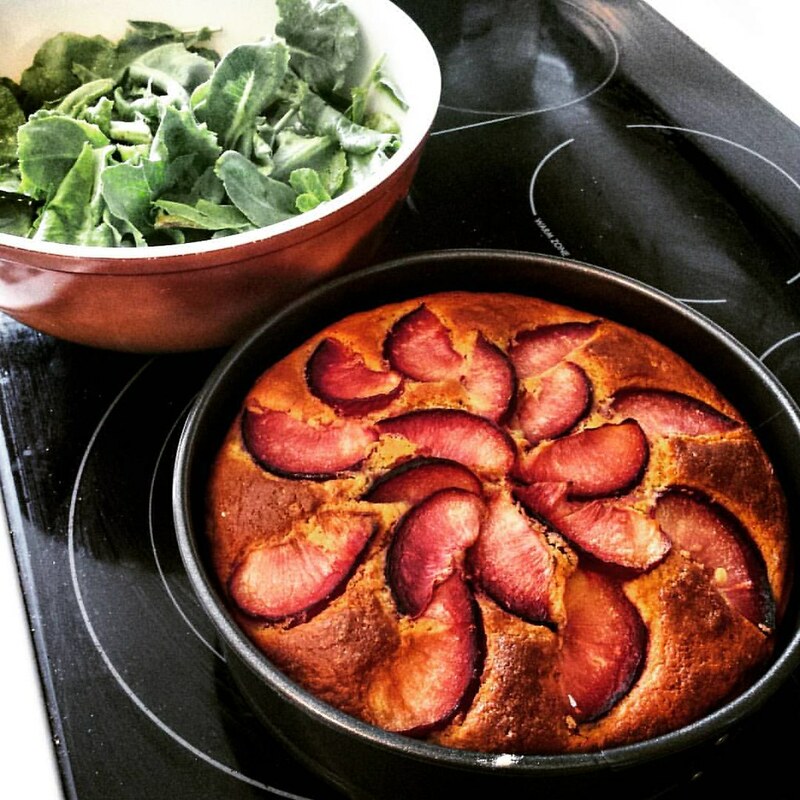 I'm a fan of plums when they're warm and caramelized in pies, muffins and cakes, though - and when it comes to Summer cakes, the simple, single-layer buttermilk variety that I've riffed off time and again still takes precedence. This time around I went full-on Summertime sweetness, roasting corn kernels to pepper the cornmeal batter, tenderizing the works with a hearty dose of buttermilk and a couple egg yolks and lightening the richness just a tad with a touch of lemon zest. The pinky-purple hue of the sliced fruit looked ever brighter against the golden yellow batter, and the combination sang whether it was barely cool enough to unmould, room temperature or reheated and topped with a scoop of vanilla frozen yogurt. For #SundaySupper this week, Coleen of The Redhead Baker is hosting our motley crew of nostalgic Summer recipes. Whether the recipes are inspired by traditions (like my annual market sojurns resulting in this cake) or the same treats made year after year without fail, the list is nothing short of heartwarming, inspiring and hunger-inducing! Double Corn Buttermilk Cake by What Smells So Good? Preheat the oven to 375F, grease a 9" springform pan. In a large, microwave-safe bowl, combine cornmeal, buttermilk and whole milk, stirring well. Microwave on HI for 30 seconds, stir and allow to sit 10 minutes. Stir in vanilla, lemon zest, egg yolks, whole egg and oil. Add the flour, baking powder, salt and sugar, stirring until just blended. Spread in the pan and top with sliced plum. Bake 35 minutes, until tests done. Cool in the pan.